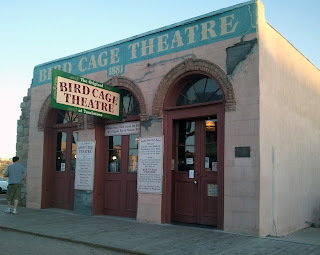 When you first see the Birdcage Theatre, you will note that it is at the end of town and small. It is a brick building with three sets of double doors in the front, each having a half-moon window above. It doesn’t have that old west look or feel on the outside, but once you step inside in the front room, you can almost see the hustle and bustle of this famous Wild West honky tonk. When the Birdcage was in its heyday, you were able to see all the way to the stage when you entered its doors. A wall now sits under the catwalk where the cowboys and miners would take the narrow stairs to the upper loft where the soiled doves stood enticing them to come up. The ceiling still has the bullet holes as a reminder of the violent history the theater endured. On the left is a display cabinet, one of the many you will see. At the cabinet you pay and are ushered through the door into the Birdcage’s past and back rooms. The first thing that greets you as you pass through the door is a wood box with glass on each side with the mermaid and blowfish inside. Along that wall is more display cabinets with many of the dusty artifacts found by the owners when they decided to open the Birdcage up for tours. Hanging on the walls are the many pictures of the famous people who hung their hats, slammed down a shot of whiskey, played poker, or sought entertainment from the many prostitutes working at the theater. Above the main floor are the rooms or cages with creepy mannequins in some of them. Above them are more bullet holes in the ceiling from the rowdy patrons. From the door you can see the stage and a narrow set of stairs leading behind the stage where the Black Mariah hearse sits. In the middle of the floor and along the walls are more antiques; pianos, desks, poker table, sewing machines, craps table, display cabinets, and a table with many more artifacts found inside the building. As you climb a short flight of stairs and to your left is the Russian room. At the top of the stairs and to your left is the soiled doves’ wall. You see many more pictures of these ladies and other famous patrons. In the corner is an old bathtub and beside that is a display cabinet with many of these ladies personal belongings. I was looking for Gold Dollar’s famous stiletto that “supposed” to have killed a soiled dove name Margarita. I never saw it or a picture of either lady, hum. As you continue moving down the back wall you will notice a coffin, the one Zak got inside. Next to the coffin sits the gem itself, the Black Mariah hearse. We noticed the wood crates sitting below. They are probably there to discourage anymore idiots from sliding underneath and getting hurt. To the right is the stairs leading down to the basement and poker room. Right before heading down the stairs you see a mannequin in a coffin next to a set of narrow stairs leading to the stage. This is the area where Ghost Hunters’ Jason and Grant saw the white lady in a bonnet moving down the stairs. In the basement where the famous eight year poker game was played sit a couple of tables set up for poker and a bar in the corner. Another set of creepy mannequins stand in the back near the bar. On the other side are a couple of rooms where the special patrons were taking care of by the soiled doves. Also in the basement is a set of stairs with a mesh opening to the upper floor next to the wine cellar which has a metal gate over the entrance. This is where the naked woman has been seen. Through the basement is a door leading to the gift shop which is where you exit the Birdcage Theatre. Man, makes me homesick! That place was sooo amazing. It not only looks it, but sounds it, smells it, feels it--haunted! Sis, it was a dream place of ours to investigate and it didn't disappoint. I hope James captured some great EVP's. KLo, it is a very cool place and thanks for the follow. AWESOME pics (as usual) Adsila!!!!! THANKS for taking us there with you via your blog! I watched the GA episode where they visited the Birdcage and you have done a much better job of capturing it visually with your still photography than they ever did on tape. Very nice. Jessica; you would like it there. Courtney; I'm glad you enjoyed the tour. MM; those are only a few of the many pictures I took. I sort of went crazy snapping pictures at everything there.